Terri signed up to hike the Assault on BlackRock and although I'm not much of a racer when I saw that the course went straight up a high mountain and then straight back down it sparked my interest. The fact that it was a mountain I've never been on and the entry fee was low combined with the promise of a belt buckle if you could finish a hundred in one minute sealed the deal and I signed up. In preparation I did the unthinkable and actually did a few training runs for it. 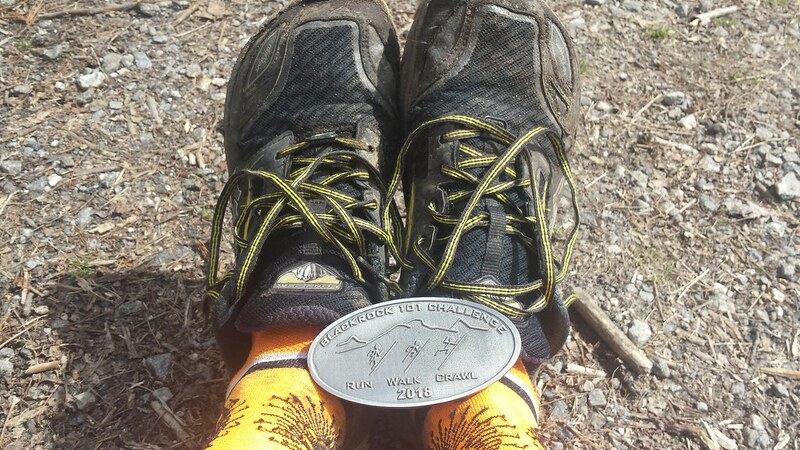 Without knowing the course I figured my best bet was just running my old favorite, Black Mountain Trail. 101 minutes to go 7 miles with a 3000 foot ascent and descent is no easy task. Black Mountain to Turkey Pen Gap trail is similar turn my attempts to run that out and back within a hundred and one minutes fell short each attempt. So, leading up to the race I was not hopeful of hitting a buckle and was well-prepared to miss a hundred and one minutes by a good chunk. After all this was going to be just a fun run with my eye on the Main Event in May. The weather was doing it's uncertain thing leading up to the race and it wasn't clear if it was going to rain the whole time or not. I packed almost all my running gear in the car in preparation for anything. In the end I decided to travel as light as possible but with still enough to be comfortable if things got bad up high. Shorts, t-shirt and arm warmers, hat and gloves, emergency jacket and 4 oz of water tucked in a pocket. The start finish area was laid back and low-key, just my style. I poked around a bit and it looked like the trail was going to be steep and rocky but plenty wide. We all lined up at the gate and waited for the 9 a.m. start time. The horn went off and we all took off with me enjoying the first few seconds in third place. That wouldn't last as a dozen or so people streamed by me over the next half mile. I was red dining just from the start but with only 7 miles to go I didn't feel the need to save anything. If I wanted that buckle there would be no time to spare. The first two miles were steep as promised but I found myself right at the required 14:41 pace that it would take to get my buckle. After that there was a bit of flat which side to the final third mile of trail that would climb 600 feet to the summit of BlackRock itself. I found myself running with the lead woman and we were both wondering when the leaders would pass us on the out and back but they didn't until we were nearing the top. That had to be a good sign. Quick turn of the top to get our numbers marked that we made it and then down we went. Third of a mile slowed me down and in order to make it back down in the time required I had 32 minutes to descend 3 miles. That would be very fast for me. Luckily the trail was wide open and very runnable. I turned my music up loud and gave it everything I had. As much as I wanted to not look at my watch I keep finding myself looking at my watch doing the math. Would I make it? I had a chance, that was for sure. When you're at the bottom I realize that if it was really only seven and a quarter miles I would make it. If it was closer to 8 I would not. Within a mile of the Finish there was an unmarked turn off to the left and I wondered if that was the way. There were no runners around me and no signs. I stayed on the road more traveled and hoped it was right. As I near the finish I fully expected to be told I was finishing off course. I was resigned to be with happy with whatever happened. My watch had me at 97 minutes or so and it appeared a buckle was mine. The descent had been pounding and I finished in a daze. I wandered around a bit and talk to a few runners as I waited for my coveted buckle. I still had a while longer to wait for Terri to finish and talked to more runners including Sean who I had exchanged emails with about running from his reading this blog (hi Sean! Good to meet you.). I made a couple more friends until Terri finished and we headed off to downtown Sylva for much deserved beer and food.